What happens when the author of the work you are adapting becomes controversial? Through Black Spruce tells the story of a Cree family coping with a missing young woman, as told through the perspective of her sister, Annie Bird (Tanaya Beatty) and her uncle, Will Bird (Brandon Oakes). The film was largely shot in Moosonee, Ont., and Toronto, with a veteran cast and crew led by director by Don McKellar, screenwriter Barbara Samuels (North of 60), and appearances by actors Graham Greene, Tantoo Cardinal and Tina Keeper. Keeper, who is also Cree, produced the film after optioning the rights to the story, which is based on the 2008 novel by Joseph Boyden. While the film is largely focused on the crisis of a missing Indigenous woman, identity is also a key issue, both onscreen and off. Through Black Spruce is a distinctly Indigenous story, but it's being directed by a non-Indigenous filmmaker in McKellar. And much like last year's TIFF film, Indian Horse, or more recently, Quebec director Robert Lepage's play Kanata, both Indigenous stories being told by non-Indigenous directors, it opens the door to a conversation around the idea of appropriation. Specifically, who should be telling them? To make matters even more complicated, Boyden, the source author, became the focus of a 2016 APTN investigation that questioned the very authenticity of his Indigenous roots. 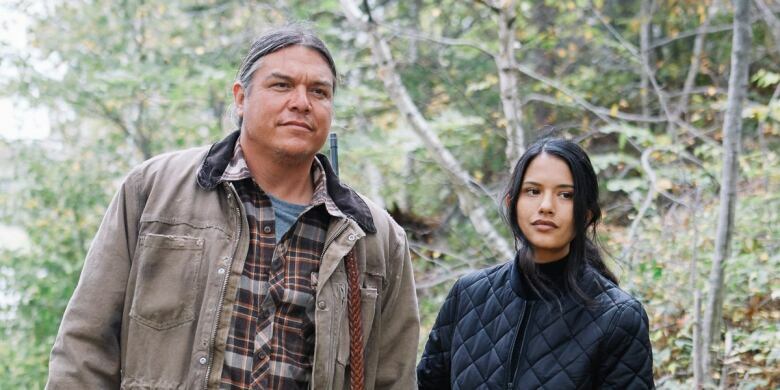 Keeper, a friend of Boyden's, had purchased the rights to Through Black Spruce in 2012, and was well underway in her adaptation of his work when the story broke. Her commitment, to both the story and Boyden, was unwavering. "I optioned it because he was an Indigenous writer and I believe he's an Indigenous writer so I didn't even regard that. It was a non-issue," she said. "We had a conversation for sure as producers. Like what does this boil down to, and this idea of identity politics is not something we wanted to engage in and we are very clear about that. I talked to Joseph on a regular basis and I believe him. I have a lot of contempt for the effort that was put into that [APTN] story… I really feel that one of the things it's about is, again, this destruction of Indigenous people that is part of this effort of colonization, which is really to destroy Indigenous people." Samuels, who had worked with Keeper on North of 60, had already written multiple drafts of the story, altering it somewhat to modernize it as well as bring the issue of Missing and Murdered Indigenous Women to the forefront. When the Boyden story became national news, "everybody was stunned bunnies, you know?" says Samuels. "You don't really know how to respond, and I mean, Tina had a friendship with Joseph so we waited to see what her response to all of this would be." If anything, the controversy only seemed to highlight what was happening in the story that Keeper and Samuels wanted to tell on the screen, which goes to great length to articulate the struggles its characters face with their own Indigenous identity. "When people are eviscerated in terms of their identity, when you take it away and you deny people a sense of who they are, where they stand, people lose the thread and the struggle to get it back," says Samuels. "This is what this story is all about, in a way, through the Bird family. Identity is at the core. Keeper and Samuels remained committed, as was production company Serendipity Point Films, so the next step was to make sure the cast still wanted to move forward. "Nobody was bowing out," says Samuels. That included veteran actor Tantoo Cardinal, who says the issue hit close to home. "I have a big heart and big empathy for people who don't know who they are, who don't know their roots," Cardinal recently told told q in an interview. "I've been a victim of that attempted slander myself. ... I know where I come from. I come from the bush, I don't have a piece of paper, I don't have anything to say that I'm a member of this or that or the other thing, but I defy anyone to talk to me about what right do I have to do anything that has to do with my world." Even Edmund Metatawabin, former chief of the Fort Albany First Nation, near Moosonee, who has criticized Boyden in the past, agreed to play a small but vital role in the film. "I think if we work together on a project that we believe in, it's more important to look at the story than say, 'He wasn't standing straight,' or something like that. Those are minor details, the story is more important," he recently told the Globe and Mail. That sentiment of the story being more important than who is telling it is echoed by Keeper, who emphasizes the importance of collaboration. That's why she never hesitated to hire McKellar and Samuels. "There are some cultural elements that need to be addressed and how we work together, absolutely. I'm not talking about those things, I'm talking about how do we collaborate and work together," she says. "Because I know [Indigenous people have] been so discarded and so dismissed in the history and the cultural memory of this country, so I just feel that it's important for us to understand all of that when we're collaborating." While she says she was thrilled to work with talented filmmakers, no matter their background — "Don and Barbara were both engaging collaborators" — Keeper also mentions recent developments, such as the Indigenous Screen Office, that will help ensure the pool of Indigenous talent is even bigger for future projects. But at the time she started working on the film, six years ago, it was the difference between making it with experienced people or, potentially, not making it at all. Although it won't always be like that. "We're at a tipping point now with the creation of the Indigenous Screen Office and a concerted effort by this Government to commit to engaging Indigenous filmmakers," Keeper says. "But that only happened this year, so it's going to hopefully be how we do business moving forward. I was very fortunate to work with such talented artists that I knew I could collaborate with and engage in a respectful meaningful way. That's important to make sure the stories get told." Through Black Spruce premieres tonight as part of the Toronto International Film Fest. Panel: Who should be telling Indigenous stories in film?